Jewish Tradition forbids the pronunciation of the four-letter name of God. This name, rooted in the Hebrew word for “being,” consists of the Hebrew letters: Yud, Heh, Vav, and Heh. According to the Sages, the name reflects the various dimensions of “being” related to time: past, present and future. As such, God figures as the One Who lives in these three dimensions and exists simultaneously in all three. This actually makes them one and the same, which means that God is completely beyond time while paradoxically existing in the confines of time. And that is why human beings are not allowed to pronounce this name, for if they were to do so, they would give the impression that they actually understand the unfathomable concept that God lives simultaneously in the past, present, future, and beyond. (The only person who was allowed to pronounce God’s full name was the High Priest on Yom Kippur in the Holy of Holiest, the single place where time did not seem to play a part [Kiddushin 71a; Yoma 39b]) That would be an untruth, and Jewish law forbids lying. God is incomprehensible and beyond all description (See: Yoma 69b; Rabbi E.E. Dessler, Michtav Me-Eliyahu, vol. 3, p. 315). He can only be addressed; His being cannot be expressed (Donald J. Moore, Martin Buber: Prophet of Religious Secularism [Fordham University Press, 1996] p. 134). When your intellect conceives of God…do not permit yourself to imagine that there is a God as depicted by you. For if you do this, you will have a finite and corporeal conception of God, God forbid. Instead, your mind should dwell only on the affirmation of God’s existence, and then it should recoil. To do more than this is to allow the imagination to reflect upon God as He is in Himself and such reflection is bound to result in imaginative limitations and corporeality. Therefore, put reins on your intellect and do not allow it too great a freedom, but assert God’s existence and deny your intellect the possibility of comprehending Him. The mind should run to and fro – running to affirm God’s existence and recoiling from any limitations, since man’s imagination pursues his intellect” (1:10, 4b). Introducing God is one of the most difficult things to do. It is like presenting a three-dimensional reality on a flat surface. Still, God is the most captivating figure in human history and His track record is most unusual. His deeds are unprecedented, yet very disturbing. He is to be loved, but often irritates. He transcends human limitation, but He gets angry and downright emotional. He is beyond criticism, yet He is judged by the strictest criteria of justice. Religious people believe that He is the only One Who really has it all together and knows what He is doing. But others are convinced that He is absent-minded, allows matters to get out of hand, and causes unnecessary pain to some of His creations. Nobody has ever been the cause of so much controversy, deafening silence, and admiration. And no one is so conspicuous even while using an ingenious hideout called the universe. Though He is the great mystery in our lives, some people have a relationship with Him as if He is their best friend, one with whom they can converse and to whom they can complain. He is the personal psychologist of millions, but is ultimately blamed for anything that goes wrong. Others deny His existence because of the many inconsistencies in His behavior; and then there are those who believe in Him but, out of anger or frustration, refuse to speak to Him. In the words of famous novelist and poet Miguel de Cervantes, “Man appoints, and God disappoints” (The History of the Ingenious Gentleman, Don Quixote of La Mancha, vol. 5, tr. from Spanish by Peter Anthony Motteux (London: Hurst, Robinson, and Co., 1822) p. 137). Who is this strange figure called God? The main thing to realize is that the term God is used arbitrarily. It often stands for completely opposing entities used by religious and quasi-religious ideologies. All of them agree that “God” affirms some absolute reality as the ultimate. But they fundamentally disagree as to what that reality entails. For Benedictus Spinoza, the Dutch philosopher and supreme Jewish rebel, and for other pantheistic thinkers, He is really an “It,” a primal, impersonal force, identical with nature – some ineffable, immutable, impassive Divine substance that permanently pervades the universe, or is the universe. God is only immanent, not transcendent; a Divine spirit that has little practical meaning in a person’s day-to-day life. Although this view is close to the kabbalistic idea of Ein Sof (the Endless and Boundless One) this is not identical to the Jewish perception of God. In the Jewish tradition, God is not an idea or just a blind force. God is the Ribono shel Olam, the Master of the Universe, Who is both immanent and transcendent, surpassing the universe, which is His creation. He has the disturbing habit of being everywhere and anywhere, and He is known to interfere with anything and everything. He is a living God, a dynamic power in the life and history of humanity, moving things around when He sees fit, smiling when He is pleased with the behavior of His creatures and annoyed when they have blundered yet again. But most important, while He does not fit into any category, He has – for lack of a better word – “personality,” and His own consciousness. Indeed, His essence cannot be expressed, but He can definitely be addressed. No doubt this is the reason why religious Jews spend little time discussing God, to the extent that it appears they have expelled Him from their emotional and intellectual lives. This may explain their “obsessive” occupation with Halacha, His Law, since that is really the only way to draw close to Him. Their intense occupation with Halacha compensates for their inability to discuss His very Being. This, however, has led to great problems in Jewish education, because it has ignored the enormous need of searching young people to actually discuss basic issues concerning faith, theology and the meaning of life, on which the whole premise of Halacha stands or falls. Even prayer, which is the most direct way to address God, has by now been so “halacha-ized” that in many synagogues it is the laws concerning prayer that have taken precedence, often at the expense of realizing to Whom one is actually speaking! It was the Chassidic Movement – with its emphasis on the actual experience of prayer – that tried to respond to this acute problem. It is not surprising that this has led to some antinomian tendencies within the Chassidic movement (See: Shaul Magid, Hasidism on the Margin: Reconciliation, Antinomianism, and Messianism in Izbica/Radzin Hasidism, [Madison, WI: The University of Wisconsin Press, 2003]). This radical difference in the conception of God makes for an equally profound divergence in attitudes about all of life and the universe. While in pantheistic and other non-monotheistic philosophies He has no moral input, nothing could be further from the Jewish concept of God. In Judaism, He is the source par excellence of all moral criteria, although He seems to violate some moral standards in the way He deals with people. Apparently, this is due to the fact that He needs to achieve certain goals with His creation that are only known to Him and remain unintelligible to humans. God’s perfection, then, is not that He is already perfect but that He strives for it. If He were to be perfect, He would lack the capacity to become perfect, which would be a terrible deficiency in His being One is reminded of American writer and philosopher Elbert Hubbard’s famous observation: “Life is a paradox. Every truth has its counterpart which contradicts it; and every philosopher supplies the logic for his own undoing” (Elbert Hubbard’s Selected Writings: Part 9 [Whitefish, MT: Kessinger Publishing, 1998] p. 408). According to pantheism and the like, the world is eternal, with no beginning. As such, it has no intrinsic purpose, since purpose is the conscious motivation of a creator to bring something into existence. It therefore follows that in the pantheistic view human beings, too, have no ultimate purpose. They, like the universe, just are; so, moral behavior may have some utilitarian purpose but no ultimate one. For radical pantheists, acting morally is not the goal of humans; it is simply a means to their survival, a way to prevent pain and achieve happiness. On a deeper level, some pantheists view the universe as an illusion – a flux of sensory deception, to be escaped. Made from a purely Divine substance, it cannot accommodate any physical reality and therefore can have no real meaning. In that case, neither can humans. Once their physical existence is branded as an illusion, they can no longer be of flesh and blood. Nor are their deeds of any real value. Since it is the body that enables people to act, and their body is part of the deception, it must follow that all human behavior belongs to the world of illusion. It is this view that Judaism protests against. God is a conscious Being Who created the world with a purpose. This world is real and by no means a mirage. People’s deeds are of great value, far from an illusion. While they may not be the primary goal of creation (See: Thoughts to Ponder 396: “God is too Great to be Justified” and Thoughts to Ponder 413: “Avraham and the Impossible God.”), they are of enormous importance. Judaism objects to the pantheistic view of people, which depersonalizes them and must ultimately lead to their demoralization. If people are part of an illusion, so are their feelings. Why, then, be concerned with a fellow human’s emotional and physical welfare? Paradoxically, this pantheism infiltrated Western culture via the back door. When we are told by certain modern philosophers that a person is only physical and their body a scientific mechanism in which emotions are just a chemical inconvenience, we are confronted with pantheism turned on its head. While pantheism denies the physical side of existence, this scientific approach rejects the spiritual dimension of a human being. In both cases, emotions are seen as part of an illusion and are therefore of little importance. Judaism, on the other hand, declares that emotions are what make a person; they are real and of crucial importance. In fact, emotions are central to a person’s existence, since they are the foundation of moral behavior. It is for this reason that Judaism views God as an emotional Being. By metaphorically attributing emotions to God, they are raised to a supreme state. If God has emotions such as love, mercy, jealousy and anger, then they must be genuine, important, and not ignored when found in humans. While some philosophers considered such anthropomorphism as scandalous, the Jewish tradition took the risk of granting God emotions so as to uphold morality on its highest level and guarantee that it would not be tampered with. For the sake of humans, even God is prepared to compromise His complete Otherness, albeit not to the point where He would be regarded as a human being. The great philosopher Ludwig Wittgenstein pointed to the danger in Western society where God has become insignificant. While the vast majority of people in the Western Hemisphere declare their belief in God, they seem to add two words to their declaration of faith: “I believe in God; so what?” In this way, the most radical encounter a person could ever have with the Master of the Universe is reduced to a senseless blur of charlatanism. It is to this that Judaism objects. Abraham Joshua Heschel put it very plainly: “God is of no importance unless He is of Supreme importance” (Abraham Joshua Heschel, Man Is Not Alone [NY: Farrar, Straus and Giroux, 1976] p. 92). Rabbi Dr. Nathan Lopes Cardozo is the Founder and Dean of the David Cardozo Academy and the Bet Midrash of Avraham Avinu in Jerusalem. A sought-after lecturer on the international stage for both Jewish and non-Jewish audiences, Rabbi Cardozo is the author of 13 books and numerous articles in both English and Hebrew. Rabbi Cardozo heads a Think Tank focused on finding new Halachic and philosophical approaches to dealing with the crisis of religion and identity amongst Jews and the Jewish State of Israel. 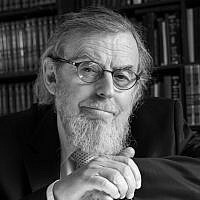 Hailing from the Netherlands, Rabbi Cardozo is known for his original and often fearlessly controversial insights into Judaism. His ideas are widely debated on an international level on social media, blogs, books and other forums.